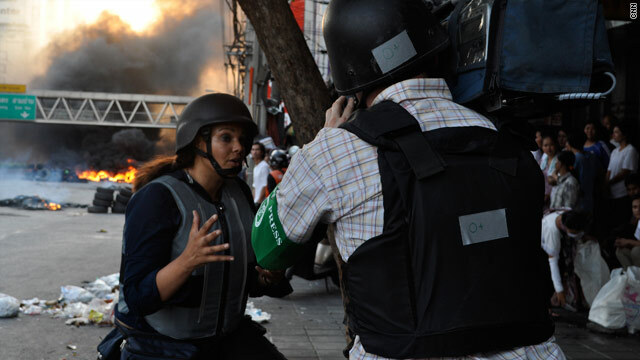 CNN's Sara Sidner reports from Bangkok on Saturday amid clashes between security forces and protesters. Bangkok, Thailand (CNN) -- We arrive with camera in tow on the back on motorcycles -- the fastest way into the protest zone. There is no traffic but the street named for a Thai King, Rama 4, isn't empty. Several piles of tires have been strewn about and set on fire. We watch thick black smoke billowing upwards. At one end of the street, protesters stand behind barricades made from barbed wire, tires and sharpened bamboo sticks. At the other end, Thai troops stand underneath an overpass. In the middle, a few young men wheel huge tires into the road. There are also regular folks standing along some of the side-streets eating, talking, but mostly watching what is going on in their neighborhood. We can see the flash of small firecrackers in the air and hear their sharp crack. We can also hear the sound of gunshots mixing with loud blasts. Suddenly the neighborhood crowds start to run. A man is down. There is yelling. Men crowd around a body on the ground. Someone has been shot. We run towards the area most are running away from. The man is clearly unconscious, clotted blood oozing from his abdomen area. People are trying to help him. They are lifting him. He is heavy and they drop him. Within seconds an ambulance screeches up. He is picked up on an orange stretcher, put into the back of the ambulance and whisked away. People tap us and start pointing to Lumpini Tower a high-rise building in front of us on Rama 4 road where all this is happening. "Snipers, snipers get down," they tell us in Thai. If snipers are there, we can't see them. Then another crack from somewhere. Another person hit. This time it's a woman. She is bleeding but conscious. Her foot has been injured. The ambulance arrives in a flash. She is taken away. The numbers of injured steadily increase throughout the day. The Thai government promised to step up security measures in the area taken over by the "Red Shirt" protesters. It appears the government has kept its promise. The military said it would increase the pressure on the protesters but that it had no intention of harming anyone. The protesters clearly blame the army for the deadly force. There is no way to know for sure who exactly is doing the shooting, but neither of the people we saw injured were armed. The sun is quickly going down on Bangkok but the situation in the commercial district is at boiling point yet again. This is no place to be. We jump on our motorcycle taxis and move out. But as we leave the question lingers: When will all this end?